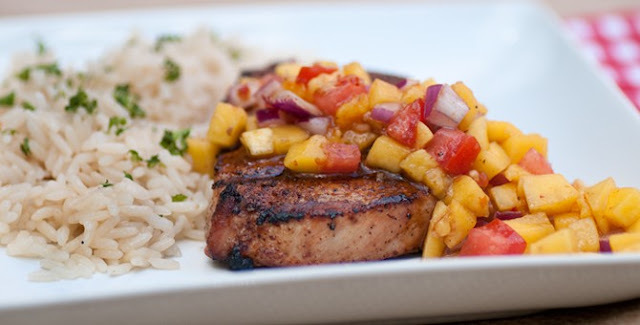 Mango salsa is a light summery addition to grilled pork. A tasty, easy way to get a little more fruit in your family's meal! Your taste buds will be tantilized with each bite you take. 1 Preheat oven at 400 F.
2 Combine garlic powder,cumin,cayenne and coriander. Add a pinch of salt and pepper. 3 Sprinkle the spice over the pork. 4 Heat 2 tbsp of oil in a pan. Sear both sides of the pork, about a minute each side. 5 Finish cooking the pork in the oven until internal temperature reaches 63 C or 145 F.
6 For the salsa, combine the mango,tomato,bell pepper,onion,spring onion,salt,pepper and lime juice. 7 Allow to sit for 30 minutes.